i feel in many ways we icelandic people are different from usa and england. somehow we missed out on the industrial revolution and modernism and postmodernism and are now coming straight from colonialism, getting our independence in 1944 and going straight to 21st century! we have a chance to enjoy our still almost untouched nature and combine it and headbutt our way into green techno internet age. Iceland is, to put it weirdly, so hot right now. Iceland is circulating through the social imaginary in a number of big-budget cinematic vehicles: Dr. Mann’s uninhabitable planet in Interstellar, the remote planet Lah’mu where Galen Erso’s family resides at the start of Rogue One: A Star Wars Story, and the land beyond The Wall in Game of Thrones, to name but a few. While there is a history of people using the island as a black basalt screen onto which they projected their desires in works like Sir Richard Francis Burton’s Ultima Thule and Jules Verne’s Journey to the Center of the Earth, the current magnetic attraction to Iceland is a significant global phenomenon. I will suggest that the allure of Iceland today emanates from the way it condenses three interconnected things. First, multiple forces of nature are spectacularly visible and renewably utilized there. Iceland combines sublime lava fields and beautiful waterfalls with dissipating glaciers, geothermal energy systems, and the recent disruption to global flight patterns by the eruption of Eyjafjallajökull. Second, the creative culture of Iceland is astonishing. Its Norse mythology and many Sagas have long been renowned. No less noteworthy is the fact that one in ten Icelanders will publish a book in her or his lifetime, and this is but one verifiable aspect of the nation’s widespread culture of creative production that runs through music, textile arts, etc. (Goldsmith 2013). Although people outside Iceland may be hard-pressed to name contemporary creative artists beyond Björk and perhaps Olafur Eliasson—who designed Reykjavik’s landmark concert hall, Harpa—these two are exemplary rather than exceptional Icelandic creators. Third, the economy of Iceland was devastated by the global banking crash of 2008. In the relatively short span of time from its independence from Denmark, Iceland became powerful by integrating itself into speculative finance capital. As that bubble continued to inflate, Iceland became magnetic, magic. So long as money was pouring in, it existed as evidence for, if not a model of, socially and ecologically responsible capitalism—at least on the surface. But after the crash, Iceland has struggled and its condensation of natural forces, creative production culture, and capitalism demands exploration. Read together, these novels act as a set of pincers with which readers can grasp elusive threads of ecological and economic crises in our lives today. The prologue of LoveStar opens on an ecological note: “When the Arctic terns failed to find their way home one spring, appearing instead like a storm cloud over the center of Paris and pecking at the heads of pedestrians, many people thought the world was coming to an end, and that this would be the first in a long series of calamities” (7). 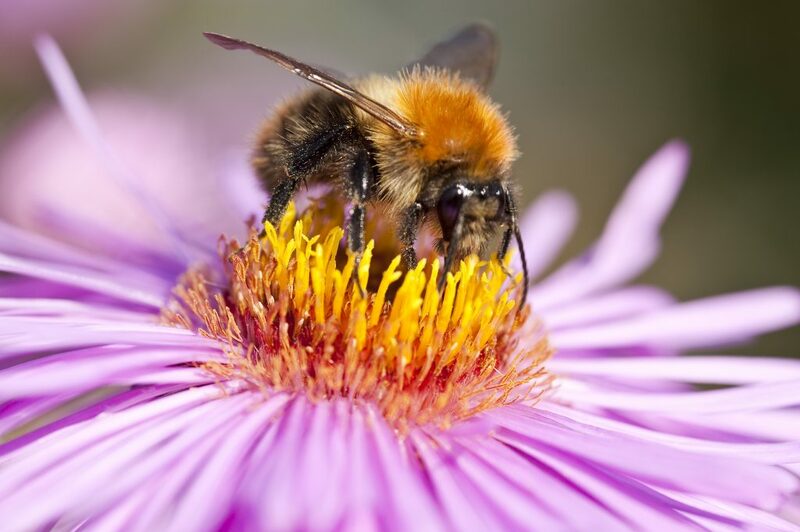 What begins with Arctic terns grows throughout the prologue into a global montage of nonhuman animals in crisis, from bee colonies collapsing to polar bears starving. LoveStar assembles an interdisciplinary project team to discover what’s causing these eco-catastrophes; they find the culprit to be the multitude of wireless communication waves permeating the atmosphere, which the corporation then leverages to innovate new sectors of generating capital. As such, the corporation that was already a disaster-capitalism leader in clean energy technologies also develops the capacity to disseminate data without the encumbrances of computers and the lines that connect them—a sort of proto-Network Function Virtualization (NFV) on steroids. So LoveStar manages to appear to Iceland and the rest of the world as a revolutionary thinker who’s found a new way to continue generating profits and growth while saving the Earth. It’s as if Magnason had an almost immediate insight into how the Bill and Melinda Gates Foundation, founded in 2000, attempted to reframe the arch-monopolist of global computing as arch-philanthropist. In terms of packaging the profit motive as philanthropy, LoveStar’s corporation also develops a sophisticated algorithm to process data from every individual on the planet and thereby identify ideal matches—a service that is marketed as working toward world peace. The novel’s vision of the logical consequence of people outsourcing their dating—their very love—to databases and algorithms, combined with the techno-utopian idea of machine learning to generate ever-better user experiences, once again feels uncannily clairvoyant. This part of LoveStar’s business is where Indridi and Sigurd come into the novel. They’ve fallen deeply in love before being subject to the algorithmic calculation, and against extreme social pressure, including their families, they’ve unplugged from the network of constant data flow. Somewhat akin to Winston and Julia in Orwell’s Nineteen Eighty-Four, Indridi and Sigurd are fuelled by their love to resist the massive structures of economy and its propaganda in which they live, and like that earlier future-dystopian pair, they still depend upon that very economy and propaganda to sustain life. What’s more, this dependence-resistance is tied to the ecological backdrop of the novel as Indridi works for LoveStar’s puffin factory. Puffins are a synecdoche of the forces of Nature that Iceland uses to market itself inside the novel and out. Inside the novel, there’s a puffin factory because a famous film LoveStar produced featured beautiful but enhanced puffins, and when flocks of tourists came to the island to see such (unknown to them nonexistent) puffins, the magnate responded by developing genetically-modified puffins that need to be relentlessly mass produced because they’re incapable of surviving in the wild. 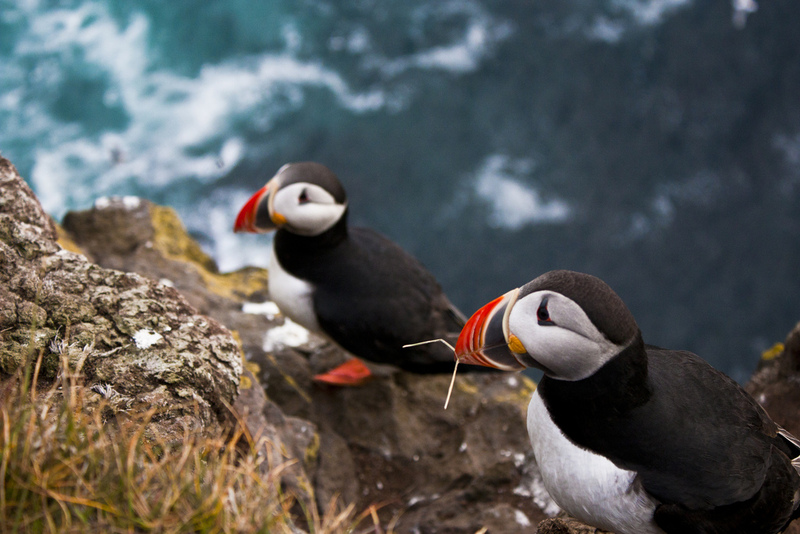 Outside the novel, puffins feature heavily in Iceland tourism marketing materials, and the Reykjavik waterfront is rife with companies that’ll take you in a boat to the nearby islands where these birds nest. This entanglement of corporate computing colonizing human love with cinema-fueled desires, tourism, and ecological devastation exemplifies the novel’s pervasive aesthetic of critical intersections. It’s as if the novel has put its finger on the interconnected horrors that are hidden within the glossy pages of an airline magazine where ads encourage us to believe in the power of algorithms to analyze human identities and produce love matches so we can find a mate and use the time we saved in doing so to travel to romantic locales like Iceland and take selfies in geothermal spas and consume organic luxury craft foods and beverages—all without worrying about things like the impacts such upscale tourism has on local ecosystems and economies, much less the voluntary posthumanization for capitalism that love algorithms entail. As a final note on LoveStar, the eponymous magnate eventually uses the wave-analysis technology to pinpoint the place where all human prayers converge on Earth. Despite all of his financial successes, LoveStar’s family separate from him and he suffers a deep malaise that drives him to develop this project of trying to locate God. Once the team knows where all prayers go, LoveStar holds conversations with his marketing director, Ragnar—whose name can’t help but conjure Ragnarök as the Norse mythological future overturning of the gods in power heralded by weird and widespread natural disasters— about how to monetize God in a way that resonates with the rest of their portfolio. In the midst of envisioning those who pray as potential subscribers, Ragnar remarks: “Nothing’s free. Who do you think paid for those medieval churches? St. Peter’s is still standing, raised on the profits of absolutions! God could have destroyed it but he didn’t. A giant colossus raised in times of poverty and famine. We’d be doing what the Church did. We’d be creating mood around him and encouraging people to pray” (226). Ragnar’s remark sparks a short epiphany in LoveStar and the latter thinks: “But it was inevitable that this would happen when they found the prayers’ destination. Nothing could stop an idea; nothing can prevent a possibility from being exploited to the full” (227). As the epiphany suggests, LoveStar does not imagine that, in spite of his accumulated powers and resources, there is any alternative to this new brand of colonizing God for profit. Yet, the novel concludes on a note of mottled hope that love and life, human and non, may persist after the Ragnarök of the titans and machineries of capitalism have broken down once and for all. Magnason’s concluding image of life and love only in the aftermath of capitalism’s self-annihilation embodies, albeit with a critical twist, what Mark Fisher has called capitalist realism—“the widespread sense that not only is capitalism the only viable political and economic system, but also that it is now impossible even to imagine a coherent alternative to it” (2). For Fisher, capitalist realist narratives incorporate ecological and other disasters as merely “temporary glitch[es]” before business largely as usual picks up where it left off in order to try and override the cracks they expose in the foundations of contemporary global capitalist structures (18). While LoveStar does seem to posit near-apocalypse as the condition that makes change possible, it ends with an impression of a true alternative emerging rather than a resilient capitalism rebooting to exploit new scarcities and vulnerabilities of love and life. Eir’s novel, by contrast, refuses to normalize and naturalize the 2008 crash. 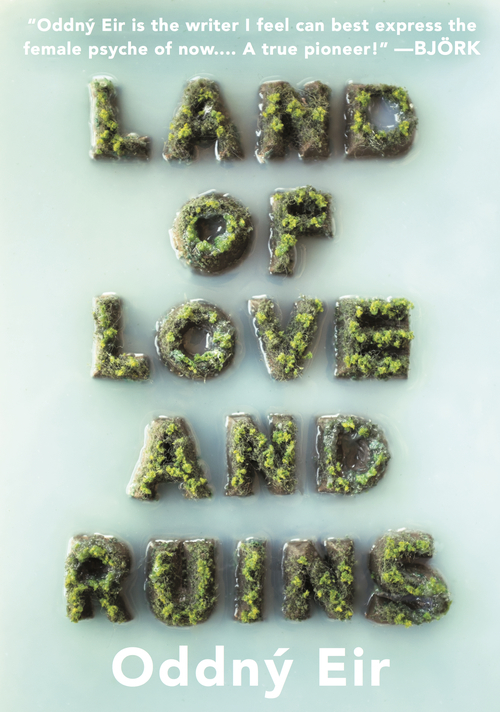 Land of Love and Ruins works relentlessly to keep the capitalist crisis that devastated Iceland open and demanding urgent reaction, reformation, revolution. The geopolitical specificity helps frame the novel into a uniquely powerful instance of what Katy Shaw refers to as “Crunch Lit”: “a body of writings that collectively function to represent the 2007-8 financial crisis. This new literature includes financial works, as well as writings for stage, television and films. These new writings engage in critical dialogue with competing representations of the credit crunch, as part of a broader cultural response to, and understanding of, the financial crash” (7). While Land of Love and Ruins warrants its own sustained analysis, here I will focus on three particular moves relating to land ownership, living arrangements of love, and a new relationship to Nature to provide a glimpse of Eir’s attempt to experiment with others to bring new alternatives into being. Throughout the novel, the narrator travels and sometimes settles around Iceland, particularly the wilder places outside of Reykjavik. One change she notes is foreign acquisition, perhaps speculation, of land: “The other day when it was reported that some filthy rich Chinese businessman was going to buy up all the land here, he [her friend, Owlie] called me and said that he never would have believed it possible to recite the verse of the Mountain Poet with such sympathetic insight: Now the North is gone from my sight, now I have no home” (185). Within this compact passage, Eir unfolds the deep complexity of global land speculation and of private land ownership in general. On the one hand, she points out how such transactions re-write, and/or threaten to delete entirely, the poetic tradition attached to the land—a tradition that in Iceland is historically less class-divisive than elsewhere given the country’s pervasive creative culture. On the other hand, she attends to the potential loss of places that contain clean water, air, and land as well as capacities for spiritual nourishment, all driven by the financial losses of the economic crash. In other words, this passage illustrates the loss of the commons—the elements of life—as directly linked with the loss of global capital. Eir here puts her finger on a critical contradiction: at precisely the moment that the narrator’s resistance based on the reasons given above is classified by others in terms of larger ideologies, this move will be done by questioning her about this specific instance. In other words, the public discourse wrestles with individual decisions and massive ideologies, all the while eliding detailed critical thinking and resistance. After all, people living under capitalism, liberals and conservatives alike, seem to share the inability to discern differences between Nazism and Communism, which is not to claim the novel is promoting communism so much as to illustrate why the narrator faces such externally-imposed difficulty in trying to imagine and enact alternative living and loving arrangements at a variety of social scales. From insights like this one, the narrator records her attempts to clarify a new notion of family life and to inhabit and reconfigure homes. This pursuit combines a mining of the past for worthy pieces of ruins that might be deployed in new designs with collaborations involving family and friends who wish also to validate the possibility of alternatives. A journey to the Lake District in England, for example, includes attentive readings in Dorothy Wordsworth’s journals to discover what did and didn’t work in how she lived in community with William and Samuel T. Coleridge alongside the narrator’s real-time experiences of joining homes as a guest and travelling alone and in groups. As a result, Eir affords us a new look at older literary texts while salvaging components that she might use without the taint of nostalgia that can accompany acts of bricolage when those acts seem to acknowledge that the structures of capitalism are the ultimate horizon of being. Put another way, Eir explores the artefacts that the Wordsworths and Coleridge, for example, created and left for us to find images, ideas, and experiments that could and should be extracted from their historical and ideological limitations in order to try them again today. Þingvellir is a national park in Iceland in which there’s a swathe of land between the North Atlantic and the Eurasian tectonic plates—a bumpy lava plain set low between two cliffs where the plates grind and drift; on that plain is the Alþingi, the Parliamentary field established as an assembly space in 930 CE. 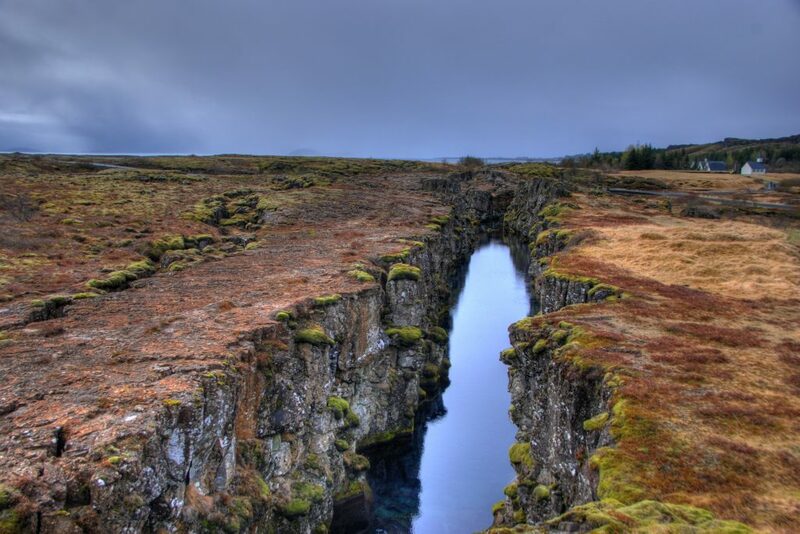 To hike around the Tectonic plate convergence in Þingvellir is to encounter a crack in the planet that is ever breaking yet ever self-suturing by the very molten magma that the suture represses—a contradiction in fluid stone. This place is unique to Iceland, yet it is also a stitching point that Eir uses to reveal much about the planet and its people, in this case by searching for terminology that rings somewhat familiar while attempting to conjure the not yet familiar. 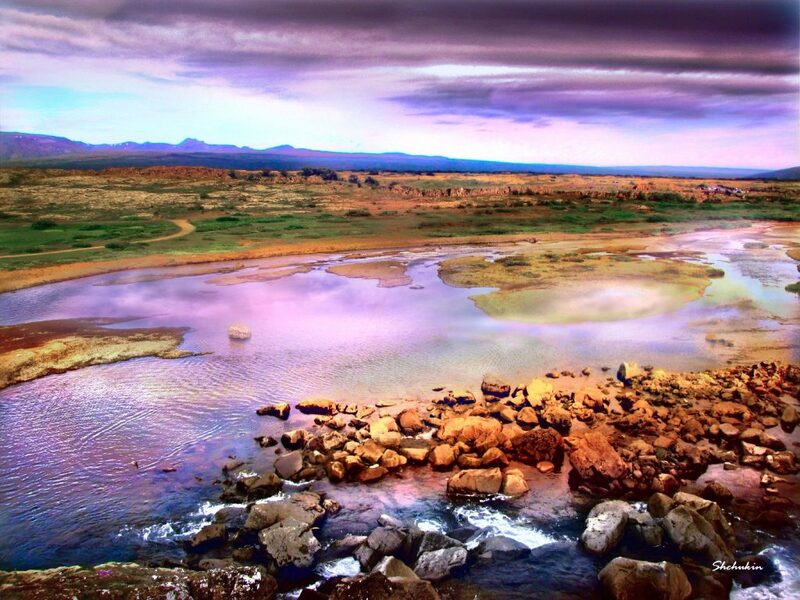 Þingvellir National Park as featured in Eir's Land of Love and Ruins. Land of Love and Ruins ends with a sense of hope that the narrator and many besides her will continue working to envision, build, and modify alternatives to the present. As such, Eir’s novel complements LoveStar and its final note of love and life revolutionized but only in the open space on the far side of total chaos and devastation. While there are indeed many positive things related to ecology and economy unfolding via Icelandic creativity, including Jón Gnarr’s amazing account of his political successes through founding the Best Party as well as the nation’s geothermal energy infrastructures, it’s crucial not to romanticize Iceland with selective vision. Recall that political imbrication in financial speculation and corruption led to Iceland’s economic woes in 2008 and the years following, yet recall also that in the wake of the Panama Papers, the Prime Minister of Iceland was one of the very few high-level leaders on the planet to step down from office. And so, readers both within Iceland and beyond the island’s borders can turn to its contemporary literature for geopolitical diagnoses of maladies and propositions for action produced by the island’s particularities. Icelandic insights may provide part of what enables us to confront the world and overcome what often appears to be an innate and inescapable inability to imagine radical alternative ways of being alive and in love. CITATION: Andy Hageman, "With Love from Iceland," Alluvium, Vol. 6, No. 2 (2017): n. pag. Web. 31 May 2017, DOI: https://doi.org/10.7766/alluvium.v6.2.04. Eir, Oddný. Land of Love and Ruins . Translated by Philip Roughton. Brooklyn: Restless Books, 2016. Fisher, Mark. Capitalist Realism: Is There No Alternative? Washington: Zero Books, 2009. Gnarr, Jón. Gnarr: How I Became the Mayor of a Large City in Iceland and Changed the World. Translated by Andrew Brown. Brooklyn: Melville House, 2014. Goldsmith, Rosie. “Iceland: Where One in Ten People Will Publish a Book.” BBC News Magazine, 14 October 2013: http://www.bbc.com/news/magazine-24399599 (Last accessed 24 May 2017). Gudmunðsdóttir, Björk, and Timothy Morton. The Huge Sunlit Abyss From the Future Right There Next To You… In: Björk: Archives, Volume 4, edited by James Merry. London: Thames & Hudson, 2015. Magnason, Andri Snær. Love Star . Translated by Victoria Cribb. New York: Seven Stories Press, 2012. Shaw, Katy. Crunch Lit. New York: Bloomsbury, 2015.